Well, it's another summer Thursday and you're starting out with a torrential downpour. But that's cool, I don't mind one bit. You can go ahead and let your freak flag fly because the summer picnics season is over! I was originally thinking of holding our grand finale this evening, but honestly you were so beautiful last week that it just seemed right to end it on that high note. Not to say that was the best picnic of the season, because they were all magnificent in their own way. There was the early last-day-of-school picnic, populated by surprise out-of-town jugglers, then there was the Bastille Day-themed indoor picnic which went into the wee hours, the heat-stroke inducing tapas picnic where people risked their own health to dine in the park, followed by the near-glacial American picnic where we all wore parkas. Ah, the memories! Last week's meze-themed spread, though, was truly sublime. Didn't you just love the hummus? 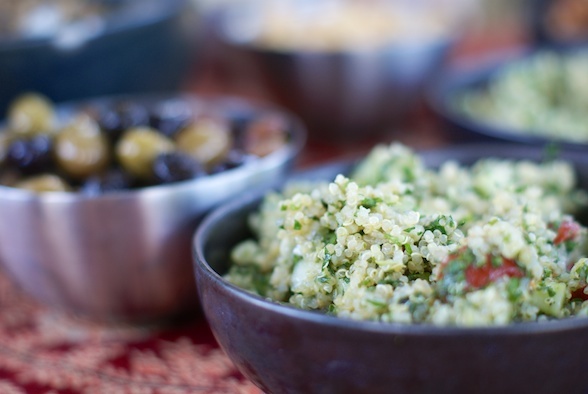 And the quinoa tabbouleh was a nice twist, too. But the desserts people brought were to die for: Blueberry cake! Tahini cookies! One thing I can say about my fellow picnic enthusiasts: they really know how to fill a table. This year, we upped it to two tables, and honestly I think a third is going to be necessary for next year. Maybe a candelabra, too. Thanks to all of you who shared in our crazy impromptu outdoor dining/dinner theater experiment. Honestly, I'm sad to see the picnic season go because what is better than a random gathering of interesting people in the best back yard ever?